Hades the Place There were several sections of Hades, including the Elysian Fields, the equivalent of Heaven, and Tartarus, the equivalent of Hell. According to some later legends, Erebus was part of Hades. It was where the dead had to pass immediately after dying. Confusingly, Erebus was often used as a synonym for Hades, the god, as well. In Roman mythology, the entrance to the underworld was located at Avernus, a crater near Cumae. "Avernus" was also an alternate name for the underworld in Roman mythology. The Inferi Dii were the Roman gods of the underworld. The deceased entered the underworld by crossing the river Acheron, ferried across by Charon (kair'-on), who charged an obolus (coin) for passage. The far side of the river was guarded by Cerberus, the three-headed dog defeated by Heracles (or Hercules as the Romans referred to him). After Cerberus, the shades of the departed entered Tartarus, the land of the dead. 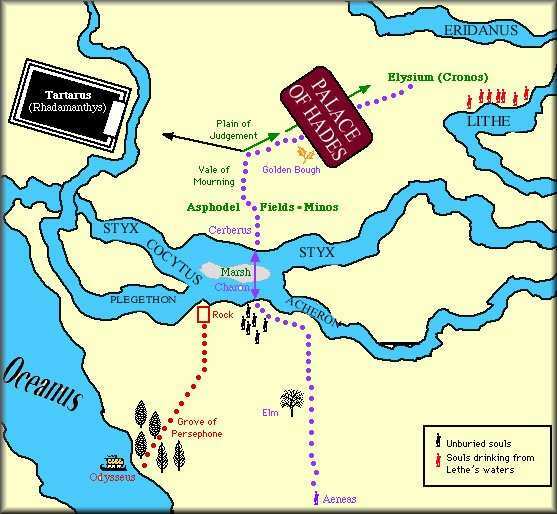 The five rivers of Hades are Acheron, Cocytus, Phlegethon, Lethe and Styx. See also Mnemosyne and Eridanus. Hades the person In Greek mythology, the god of the underworld was named "Hades" because and after the unseen kingdom of that name. Hades had two brothers (sons of the Titan Cronus) Zeus, Poseidon and Hades drew lots for realms to rule. Zeus got the sky, Poseidon got the seas, and Hades received the underworld, the unseen realm to which the dead go upon leaving the world. Hades obtained his eventual wife, Persephone, through trickery - a story that was a late addition to Greek mythology, connected with the rise of the Mysteries. Hades was a fearsome figure to those still living; in no hurry to meet him, they were reticent to swear oaths in his name. To many, simply to say the word "Hades" was frightening. So, a euphemism was pressed into use. Since precious minerals come from under the earth (i.e., the "underworld" ruled by Hades) he was considered to have control of these as well, and was referred to as "Ploutos", Greek "wealth." This explains the name given him by the Romans, "Pluto." Sophocles explained referring to Hades as "the rich one" with these words: "the gloomy Hades enriches himself with our sighs and our tears." In addition, he was called Clymenus ("notorious"), Eubuleus ("well-guessing") and Polydegmon ("who receives many"). Although he was an Olympian[? ], he spent most of the time in his dark castle in the Underworld. This Lord of Hell, who was formidable in battle, proved his ferociousness in the famous battle of the Olympians versus the Titans, which established the rule of Zeus. Because of his dark and morbid personality he was not especially liked by neither the gods nor the mortals. His character is described as "fierce and inexorable", and by far of all the gods he was most hated by mortals. He was not however an evil god, for although he was stern, cruel and unpitying, he was still just. Hades ruled the Underworld and therefore most often associated with death and was feared by men, but he was not Death itself - The actual embodiment of Death was another god, Thanatos. When the Greek prayed to Hades, they banged their hands on the ground to be sure he would hear them. Black animals, such as sheep, were sacrificed to him, and it is believed that at one time even human sacrifices were offered. The blood from sacrifices from Hades dripped into a pit so it could reach him. The person who offered the sacrifice had to turn away his face. Every hundred years festivals were held in his honor, called the Secular Games. Hades' weapon was a two-pronged fork, which he used to shatter anything that was in his way or not to his liking, much like Poseidon did with his trident. This ensign of his power was a staff with which he drove the shades of the dead into the lower world. His identifying possessions included a famed helmet, given to him by the Cyclopes, which made anyone who wore it invisible. Hades was known to sometimes loan his helmet of invisibility to both gods and men (such as Perseus). His dark chariot, drawn by four coal-black horses, always made for a fearsome and impressive sight. His other ordinary attributes were the narcissus and cypress plants, the Key of Hades and Cerberus, the three-headed dog. He sat on an ebony throne. In Roman mythology, the god Dis Pater ("the wealthy father") was an underworld deity later subsumed by Pluto, the Roman Hades. Every one-hundred years, a festival called the Ludi Tarentini[?] was celebrated in his name. He was the ancestor of the Gauls. The Roman ruler of the underworld and fortune, similar to the Greek Hades. Every hundred years, the Ludi Tarentini were celebrated in his honor. The Gauls regarded Dis Pater as their ancestor. Hades is always represented as a stern, dark, bearded man, with tightly closed lips, a crown on his head, a sceptre and a key in hand, to show how carefully he guards those who enter his domains, and how vain are their hopes to escape. No temples were dedicated to him, and his statues are very rare. In works of art, Hades resembles his brothers, Zeus and Poseidon, except that his hair falls over his forehead, and his appearance is portrayed as dark and gloomy. The wife of Hades, and queen of the Underworld, was Persephone, daughter of Zeus and Demeter. Persephone did not marry Hades willingly, but was abducted by him one day while picking flowers with her friends. Even Zeus was powerless to get her out of the Underworld when her mother, Demeter, asked him to act on her behalf. Eventually a deal was made, with the messenger god Hermes acting as the mediator - Persephone would spend half the year with her mother, the goddess of the harvest. The Greeks believed that while Persephone was with Hades, her mother missed her so much that she withdrew her gifts from the world and winter came. In the spring, when Persephone rejoined her mother, Demeter would make things grow again. According to some, Persephone eventually became as cruel as her husband. Hades only showed mercy once. Because the music of Orpheus was so hauntingly sad, he allowed Orpheus to bring his wife, Eurydice, back to the land of the living as long as she walked behind him and he never tried to look at her face until they got to the surface. Orpheus agreed but failed and lost Eurydice forever. Like his brother Zeus and other ancient gods, Hades wasn't the most faithful of husbands. He pursued and loved the nymph Mintho and to punish her for this, his jealous wife Persephone turned Mintho into the plant called mint. Likewise, the nymph Leuce, who was also ravished by him, was metamorphosed by Hades into a white poplar tree after her death. Hades imprisoned Theseus and Pirithous, who had pledged to marry daughters of Zeus. Theseus chose Helen and together they kidnapped her and decided to hold onto her until she was old enough to marry. Pirithous chose Persephone. They left Helen with Theseus' mother, Aethra and travelled to the underworld, domain of Persephone and her husband, Hades. Hades pretended to offer them hospitality and set a feast; as soon as the pair sat down, snakes coiled around their feet and held them there. Theseus was eventually rescued by Heracles. Heracles' final labour was to capture Cerberus. First, Heracles went to Eleusis to be initiated into the Eleusinian mysteries. He did this to absolve himself of guilt for killing the centaurs and to learn how to enter and exit the underworld alive. He found the entrance to the underworld at Tanaerum[?]. Athena and Hermes helped him through and back from Hades. Heracles asked Hades for permission to take Cerberus. Hades agreed as long as Heracles didn't harm him, though in some versions, Heracles shot Hades with an arrow. When Heracles dragged the dog out of Hades, he passed through the cavern Acherusia.